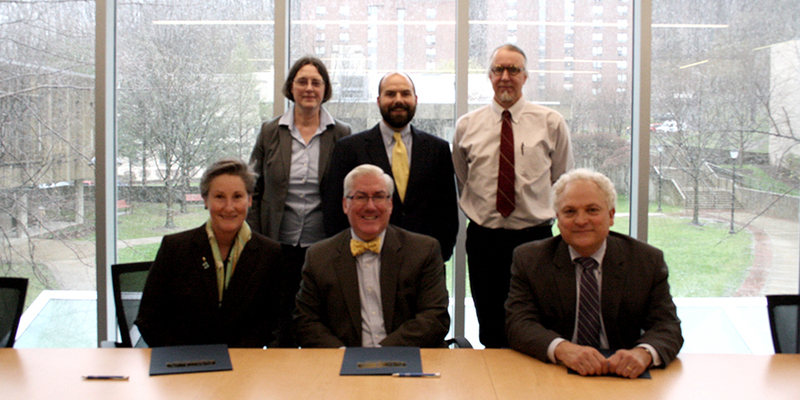 NORTH ADAMS, Mass.—Massachusetts College of Liberal Arts (MCLA) announces the campus has signed a 3 + 3 articulation agreement with Western New England University (WNEU) School of Law to establish a joint program leading to a Bachelor’s Degree and a Juris Doctor Degree. Front row, from left to right, WNEU Provost Linda Jones, President Birge, WNEU School of Law Dean Eric Gouvin. Back row, from left to right, MCLA Vice President of Academic Affairs Dr. Cynthia Brown; Dr. Ben Taylor, MCLA assistant professor of history, political science and public policy; and Dr. Matthew Silliman, MCLA philosophy professor (submitted photo).